Harrods is a department store located on Brompton Road in Knightsbridge , London, England. The Harrods brand also applies to other enterprises undertaken by the Harrods group of companies including Harrods Bank, Harrods Estates, Harrods Aviation and Air Harrods. The store occupies a site and has over one million square feet (90,000 m2) of selling space in over 330 departments. This makes Harrods one of the largest department stores in the world together with Macy's New York. The UK's second-biggest shop, Oxford Street's Selfridges, is a little over half the size with of selling space. The Harrods motto is Omnia Omnibus Ubique — All Things for All People, Everywhere. Several of its departments, including the seasonal Christmas department and the Food Hall, are world famous. Harrods was established in 1834 in London’s East End , when founder Charles Henry Harrod set up a wholesale grocery in Stepney , with a special interest in tea. In 1849, to escape the filth of the inner city and to capitalise on trade to the Great Exhibition of 1851 in nearby Hyde Park , Harrod took over a small shop in the district of Knightsbridge , on the site of the current store. Beginning in a single room employing two assistants and a messenger boy, Harrod’s son Charles Digby Harrod built the business into a thriving retail operation selling medicines, perfumes, stationery, fruit, and vegetables. Harrods rapidly expanded, acquired the adjoining buildings, and employed one hundred people by 1880. However, the store’s booming fortunes were reversed in early December 1883, when it burnt to the ground. Remarkably, in view of this calamity, Charles Harrod fulfilled all of his commitments to his customers to make Christmas deliveries that year — and made a record profit in the process. In short order, a new building was raised on the same site, and soon Harrods extended credit for the first time to its best customers, among them Oscar Wilde, legendary actresses Lillie Langtry and Ellen Terry, Noël Coward, Sigmund Freud, A. A. Milne, and many members of the British Royal Family. On Wednesday, 16 November 1898, Harrods debuted England's first "moving staircase" (escalator) in their Brompton road stores; the device was actually a woven leather conveyor belt-like unit with a mahogany and "silver plate-glass" balustrade. Nervous customers were offered brandy at the top to revive them after their 'ordeal'. 1905: Begun in 1894, the present building is completed to the design of architect Charles William Stephens. 1912: Harrods opens its first and only foreign branch in Buenos Aires , Argentina . It became independent of Harrods in the late 1940s but still traded under the Harrods name usable only in Argentina Harrods Buenos Aires. 1914: Harrods buys the Regent Street department store Dickins & Jones. 1919: Harrods buys the Manchester department store, Kendals ; it took on the Harrods name for a short time in the 1920s, but the name was changed back to Kendals following protests from staff and customers. 1959: The British department store holding company, House of Fraser, buys Harrods. 1969: Christian the lion was bought by John Rendall and Anthony 'Ace' Bourke. The lion was set free in Kenya after reaching maturity. 1983: A terrorist attack by the Provisional IRA outside the Knightsbridge store kills six people. 1985: The Fayed brothers buy the store for £615 million. 1986: The small town of Otorohanga in New Zealand briefly changed its name to Harrodsville in response to legal threats made by Mohamed Al Fayed against a person with the surname of Harrod, who had used the name "Harrod's" for his shop. Other town businesses changed their store name to Harrod's in support, and the resultant lampooning in the British press led to Al Fayed dropping the legal action. 1990: A Harrods shop opens onboard the RMS Queen Mary in Long Beach, which was then owned by the Walt Disney Company. 1994: The relationship between House of Fraser and Harrods is severed. Harrods remains under the ownership of the Fayed family, and House of Fraser is floated on the stock exchange. 1997: The British court issues an injunction to restrain the Buenos Aires Harrods store from trading under the Harrods name. 2006: The Harrods "102" store opens opposite the main store on Brompton Road; it features concessions like Krispy Kreme and Yo! Sushi, as well as florists, a herbalist, a masseur, and an oxygen spa. 2006: Omar Fayed, Mohamed's youngest son, joins the Harrods board. The store's 330 departments offer a wide range of products and services. Products on offer include clothing for every sort of customer (women, men, children, and infants), electronics, jewelery, sporting gear, bridal trousseau, pets and pet accessories, toys, food and drink, health and beauty items, packaged gifts, stationery, housewares, home appliances, furniture, and much more. A representative sample of store services includes 28 restaurants (number has been questioned by Billy Mc), serving everything from high tea to tapas to pub food to haute cuisine; a personal shopping-assistance programme known as "By Appointment"; a watch repair service; a tailor; a dispensing pharmacy; a beauty spa and salon; a barbers shop; Harrods Financial Services; Harrods Bank; Ella Jade Bathroom Planning and Design Service; private events planning and catering; food delivery; a wine steward; bespoke "picnic" hampers and gift boxes; bespoke cakes; and bespoke fragrance formulations. Up to 300,000 customers visit the store on peak days, comprising the highest proportion of customers from non-English speaking countries of any department store in London. More than five thousand staff from over fifty different countries work at Harrods. A fleet of fifty delivery vehicles make up to 225,000 deliveries every year. Approximately 11,500 energy-efficient light bulbs turn Harrods into a beacon of light each night, 300 of which are replaced every day. There are also a number of concessions opposite the main store on Brompton Road in 'Harrods 102' such as Turnbull & Asser, HMV, Waterstones, Krispy Kreme and David Clulow Opticians. As of the 15 October 2009, Harrods Bank has started selling gold bars and coins that customers can buy "off the shelf". The gold products range from 1g to 12.5 kg, and can be purchased within Harrods Bank. They also offer storage services, as well as the ability to sell back gold to Harrods in the future. Harrods and Mohamed Al Fayed have been criticised for selling real animal fur with regular protests organised outside Harrods. Harrods is the only department store in the UK that has continued to sell fur. Harrods was sharply criticized in 2004 by the Hindu community for marketing a line of feminine underwear (designed by Roberto Cavalli) which featured the images of South-Asian goddesses. The line was eventually withdrawn and formal apologies were made. Harrods had held The Duke of Edinburgh's warrant since 1956, but it was rescinded by Prince Philip on 21 December 2001 because of a "significant decline in the trading relationship" between the duke and the store. Al Fayed then pre-emptively removed all the royal coats of arms that had been prominently displayed by the business, even though other warrants were yet to expire or be withdrawn. None of the royal grantors of warrants had spent any money at Harrods since 1997, the year Diana, Princess of Wales, died. On 10 September 2002, Harrods hired a live Egyptian cobra to protect the shoe counter, guarding a £62,000 (€84,880) pair of haute couture ruby-, sapphire- and diamond-encrusted sandals launched by designer Rene Caovilla. After the death of Michael Jackson, Al-Fayed announced that they had already been discussing plans to build a memorial statue of the singer. "The First Moving Staircase in England." The Drapers' Record, 19 Nov. 1898: 465. Rick Steves, Getting Up To Snuff In London, /www.ricksteves.com. 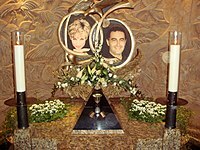 Harrods unveils Diana, Dodi statue, CNN.com, 1 September 2005.